Your essential Canon EOS 6D camera field guide in a convenient pocketable style. This EOS Pocketbook for the 6D is a concise guide to your camera and small enough to carry with you everywhere. As EOS cameras become more sophisticated, so the Canon instruction manuals get longer. Whilst the manual is always essential reading, you need something a little more pocketable when out and about. Nina Bailey, Technical Editor of EOS magazine and author of the popular EOS eBook series, has the solution. 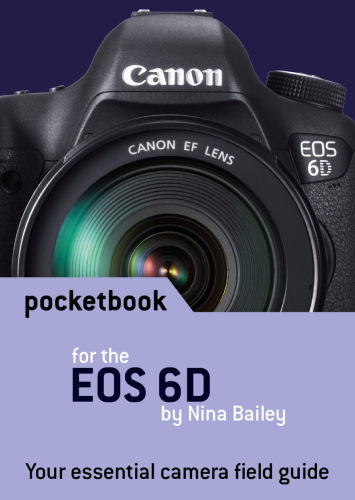 This new Pocketbook for the Canon EOS 6D is a concise guide to the most used and confused features and controls on your camera, based on Nina’s vast experience as lecturer at EOS Training Academy – hearing first-hand what photographers want to know and understand about how their EOS 6D camera operates. It's printed in full colour and only A6 in size (105 × 148 mm), so is truly pocketable and portable. Slip into your camera bag or pocket and this little guide is on-hand to remind you of the key controls and overrides for your camera when out in the field. And for extra protection when out-and-about, your Pocketbook comes in a durable clear plastic pocket. The pocketbook is complete, clearly explained and concise. But it gives a lot of technical good advises. Very easy to read and understand. This looks like a very handy reference. I gave only purchased this item to try and revitalise my interest in using my 6D, hope it works or my EOS system is god sale.